Home Ask SISTRIX Sitemaps What do I have to keep in mind when creating a video-sitemap? What do I have to keep in mind when creating a video-sitemap? A video-sitemap is the basis for providing Google with the necessary information about the content of your videos. The video sitemap is an XML-file and contains your videos’ meta-data, like title, description, length, and source. Using a video-sitemap ensures that your video content can be recognised and indexed much faster by the GoogleBot. 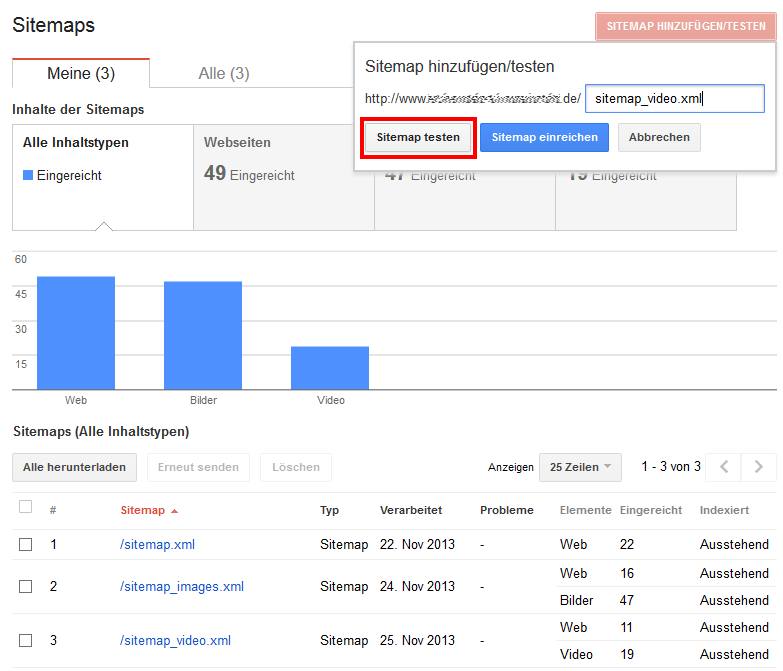 Google also recommends using the schema.org markup for the video content on your website. Google recommends using the schema.org markup for the videos on your website, which helps Google better understand their contents. Schema.org offers the vocabulary which lets you structure the data and is supported by the search engines Google, bing and Yahoo!. To quickly and easily use the schema.org Markup on your video content, we developed the free Video Rich Snippet Generator for schema.org Markup. The content of a video-sitemap follows an easy XML-syntax. Aside from essential elements, there are also a lot of optional information that can be added to an entry in the sitemap. You can create your video-XML-sitemap either by hand, using the above example, or you can use one of the numerous sitemap generators you can find online. If you use a sitemap generator, please make sure that they use the correct XML-syntax for video-sitemaps. This includes converting the schema.org Markup, which is specified in the ISO 8601 date format, into seconds. The XML-syntax, on the other hand, only allows seconds as the value for the element. Tip: The Sitemap-Generator by XML-Sitemaps.com, which is fee-based, offers the possibility to generate and update a dedicated video-sitemap in the XML format through an addon. The software also supports the international date format ISO 8601. You can submit a video-sitemap like any other XML-sitemap through the Google Search Console. In any case, it is recommended to test the video-sitemap for errors by selecting “Test Sitemap”. The test results will show you if the contents of the video-sitemap are valid and if Google can process it without errors. In our example the XML-syntax of the video-sitemap returns an error because the value for the element is still in the date format ISO 8601, instead of in seconds.